RIGHT ON THE BEACH AND ONLY STEPS TO THE SAND / NEW KITCHEN REMODEL! This 2 br/ba second floor condo beach retreat is located at the popular Kanai A Nalu complex in the quaint harbor village of Maalaea! 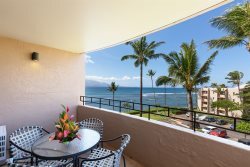 This condo has beach access to the longest sugary golden beach on Maui that's suitable for all water activities and watching whales (during whale season). Beautiful newly remodeled kitchen featuring rich bamboo cabinets and an impressive granite counter top! New travertine floor tile installed through-out the main living area too! Enjoy a peaceful view of the breathtaking Maalaea Bay, and the sounds of the gently rolling waves. From your lanai you can relax and enjoy a moon lite cocktail or a morning sunrise breakfast! The complex features lush and tropical grounds and a beach that stretches for miles - stroll, jog or play in the surf! Have fun frolicking in the "beach side" heated pool, cook up a feast at the "beach side" BBQs and relax and get a great tan "beach side" on one of the comfy lawn lounges. Master suite has comfy queen with it's own master bath and 32"LED Smart TV with cable. Bath also recently remodeled with nice tile walk in show. Guest room has two extra long twins that can be put together to make a comfy king and 32" tv with cable. Guest bath updated too with a spacious walk in shower. Air-conditioning located in the living room and ceiling fans in every room to help keep you nice and cool. But who needs those when you have the cooling Tropical Trades to keep you comfy. Other available amenities for your convenience are free Wireless Internet, TV, DVD, cable, beach chairs, beach umbrella, beach towels and a cooler for your excursions and free parking. Sorry No Smoking or Pets Please! Make yourself at home and enjoy! Loved the location and interior of the condo! It had been 19 years since I had been able to visit the Hawaiian Islands. I won't let that much time pass by again, and I want to stay at the same condo on my next visit! The interior of the condo fit so well for myself, my mother, and my 2 sons. The kitchen and the beach items were very well equipped. The staff at Maui vacations were very attentive especially the primary property manager. He even called after we were home to ensure everything had gone well. Thank you! A wonderful location on the beach - easy access to everything I did leave a note in the guest book for the owners. It was a very pleasant vacation. The location was perfect! I loved the fact that we were right on the beach which is what we wanted and the panoramic view was awesome! The accommodation was comfortable. We enjoyed having the ceiling fans. I was missing a few items for cooking ie. a roasting pan, except for the one pyrex cookware piece . However, who actually cooks full meals? Me.........because my son wanted turkey!!! A few more bowls would be good. Otherwise it was ok in the kitchen. We noticed a cupboard hinge was not working. My son took a look at it, but couldn't fix it. (close to the window). I was in the second bedroom and was very happy to find a walk- in shower. The place was very clean. I loved the fact that we could sit on the balcony which we did. The pool was great! It was also very clean and did not smell of chlorine, The maintenance man seemed to work diligently. We used the barbeque and that was good! In all, we would definitely choose this place again! It was great and the location was wonderful! The four of us stayed for about a week and the place was very roomy, clean, and location was great! The management team really helped and was responsive with questions! We will be back! Condo in Paradise! Perfect location to enjoy numerous activities. Loved the convenience of a fully appointed condo. Loved the view from lanai, the pool, and walking on the beach. Unit is very nice, clean and comfortable. Had everything we needed to include beach chairs, towels and ice chest. Highly recommend this condo for up to 4 people. What a Wonderful place. We arrived and were pleasantly surprised. Everything was spotless and Quiet. The Beach is perfect for peaceful relaxation and snorkeling. We loved having coffee every Morning with the amazing view .Great place to call home while you explore the island. Sea Turtles every day is also a plus. Thanks Amy for making it a perfect vacation. A beautiful condo, very well stocked & clean! Would definitely recommend. Great location and accommodations. Our unit was clean, quiet, comfortable and well supplied (beach chairs, boogie boards, beach towels). Communication before and during with Andreas was good. We would definitely stay here again. Wonderful stay. The condo was wonderful. We will be back again soon. It is the perfect place to have the entire family share time together. Great Vacation! We have stayed at this property over the years and keep coming back for multiple reasons. The condominium is centrally located if you want to visit any of the larger communities for shopping and dining. It is quiet and the ability to walk the beach a great distance is ideal for morning exercise and a swim afterwards. The view from the lanai or from inside is another factor and rarely do we find a reason to turn on the TV. The property has been updated and is well maintained. The property manager and staff are available for any potential issues or inquiries and always ensure that you have a wonderful stay. We are ready to go back right now! More than we expected We were pleasantly surprised by how well the condo was set up. There were so many nice touches that were so welcoming. The location was very central with excellent beaches. We had no complaints and had a peaceful stay on Maui. We will be back and staying in the same location. Fantastic place to stay! This is a beautiful condo. We have stayed here once before and always love it. It is always very clean and comfortable. The view off the lanai is fantastic! We never get tired of the view. We watched whales almost daily. The beach behind the condo is the best. We walked nearly 2.5 miles everyday on the beach with turtle viewings daily. We did a Trilogy Sail boat trip from Lahaina to Lana'i that was amazing. Plus other trips around the island. The botanical gardens, Ocean distillery tour and lunch at Kula Lodge. (A favorite spot!) The west loop, north shore surfers and turtles. We will be back and would recommend this condo to others!